When you've had a baby, you're supposed to love it. Often, unbidden, you do. Sometimes, it's just plain old love and not Love love, though. It can happen that, in the madness that follows the appearance of a baby, you're absolutely bewildered by what has just happened to you. It feels like parts of you have exploded, there's a room full of people, and noise, and - paradoxically - silence, the kind of silence that sets in when you're about to faint, a drowning out of everything that's going on, as your mind tries to pull itself together. You have to figure out what's just happened; if you're all right; if the baby's all right. What time of the day or night is it? (because the day you give birth becomes a weird kind of non-day in which time seems to stand still and you give not a single, solitary fig about anything that happens outside your delivery room.) You're given a baby and, while some women immediately fall in love with their child, others (like me) look at it and try to figure out what on earth I'm supposed to do with it and, goodness, doesn't he look strange and what are these people all doing to me? Of course, you love your baby. You do. But at that point, you love it the same way you love a puppy or kitten - in fact, puppies or kittens have the advantage of being cuter than most newborns. My midwife always warns mothers not to worry if they don't feel the Love love they're "supposed" to feel straight away. Sometimes you just don't - sometimes it takes a while. But you will learn to Love love your child. It'll sneak up on you, never fear. One day you'll look into your baby's eyes and you will think, "I would die for you. I would gladly lay down my life for your tiny soul." And that's it: the little sucker has you hooked. The word 'bond' explains it perfectly: you're glued together for life. This is a sneaky move. 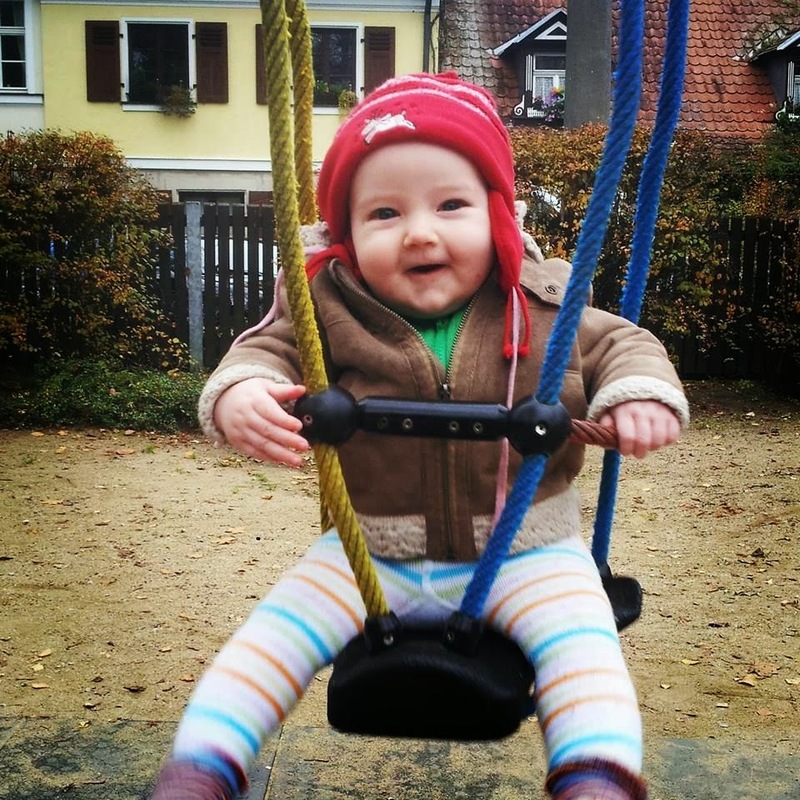 They're just plopping around, leering cross-eyed at anything that moves and then, suddenly, they focus on you (or your partner: Baby Robert decided that his father was more smile-worthy than me) and grin. Was it gas? Was it an accident? Was it ... a smile? After that, you find yourself doing remarkably stupid things without a trace of self-consciousness to get another one, competing with your partner for a token of affection from a 6-week-old. 2. You want to eat your baby. I don't know why this strong love develops side by side with an inclination towards cannibalism. You have a handful of baby chub - a fat leg, a pudgy arm - and you just have to lean in for a nibble. You find yourself nuzzling a jabbery jowl while making "Nomnomnom!" noises. Rather than be alarmed by this, babies tend to find this hysterical. They laugh, waving limbs madly, and setting off ripples of cellulite (because, yes, babies have cellulite. There's no hope for the rest of us.) Spurred on by the recognition of your natural funniness (finally), you just have to dip down and nibble a toe. Hiccup-inducing mirth follows. This is how stand-up comedians feel on a good night. It's a heady feeling: regardless of your level of slapstick, your child will find you hilarious. Yes, you get a warm melty feeling in your chest region. It might come when your child is doing something remarkably cute, like sucking a tiny thumb in his sleep or pointing at a kitten or whatnot. In our case, it came at moments slightly less idyllic. Recently my husband stood side by side at our bed and watched our youngest baby suckle the pillow. "Awww," we said. "The poor little nincompoop." Similarly, we watched his brother topple over into a puddle (wail!) and exchanged fond smiles: "Awww. Isn't he a proper little eejit?" Bless their little socks. Occasionally the hairs on the back of my neck stand up and I know I'm being watched. I turn around to this face, the face of a child who does not understand what I'm doing but knows one thing: he's not in the middle of it - and he genuinely doesn't understand why not. We've bonded, we're joined at the hip, Mama + Rob 4 ever. He's right, you know, though I do expect him to lead a reasonably independent life at some stage. But I'll break that to him later. So if you're having a baby or have just had a baby and you're not feeling the Love love, don't worry. You will. It might take days or weeks. Or even months. But don't worry, that baby will reel you in. It's just a matter of time. 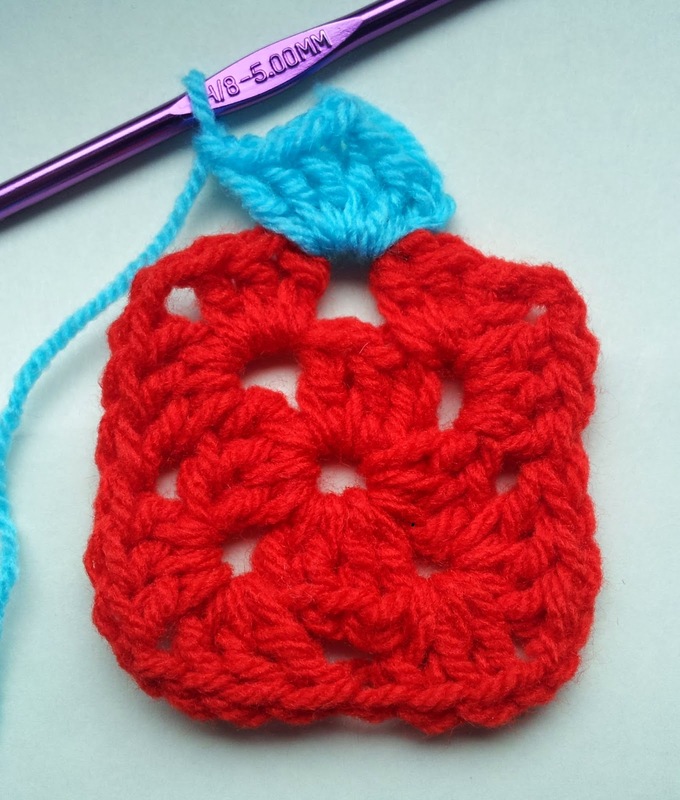 This is a very simple variation of a traditional granny square. 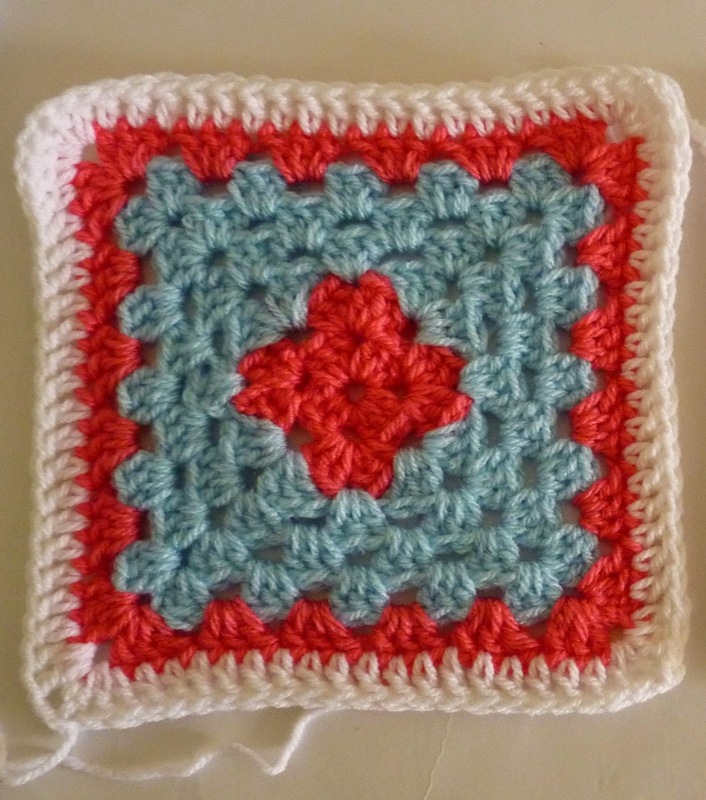 I think it works best as a four-round square, so the contrast in the colours is best seen. The instructions use American terminology, the British terms are in [brackets]. 1st round: chain 3 (this counts as your first treble) and do 2 DC [TR] into the foundation ring. *Ch 2, 3 DC [TR] into ring**, rep. from * to ** twice. You should be back at the beginning. 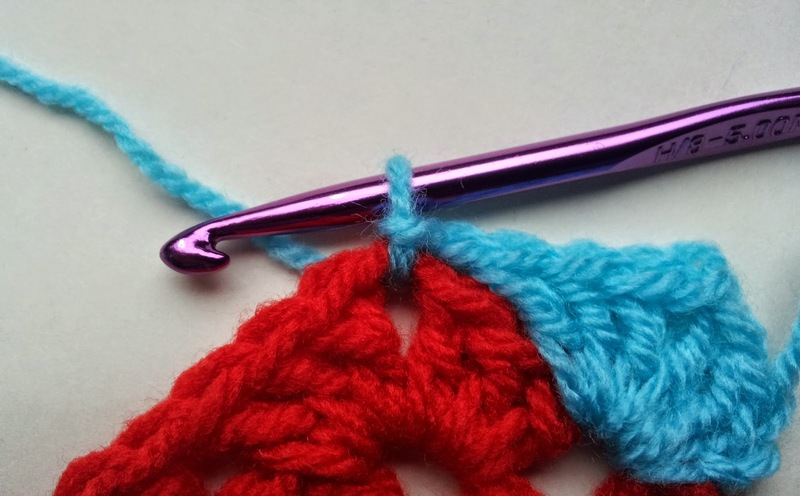 Join the stitch on your hook to the start of the round with a slip stitch. 2nd round: 3 chain, 2 DC [TR] , 2 chains and 3 DC [TR] . This forms your corner. Work *3 DC [TR], 2 chains and 3 DC [TR]** into the next corner space. Repeat from * to ** twice more. Join with a slip stitch. Do one more chain, yank yarn tight and cut a tail. Weave in your tail. 3rd round: Join your new yarn in the space between corners. Work 4 chain, 2 DC [TR], 2 chains and 3 DC [TR]. Chain 1, * then do a slip stitch in the corner space of the previous row and chain one again. Repeat from * to ** twice. 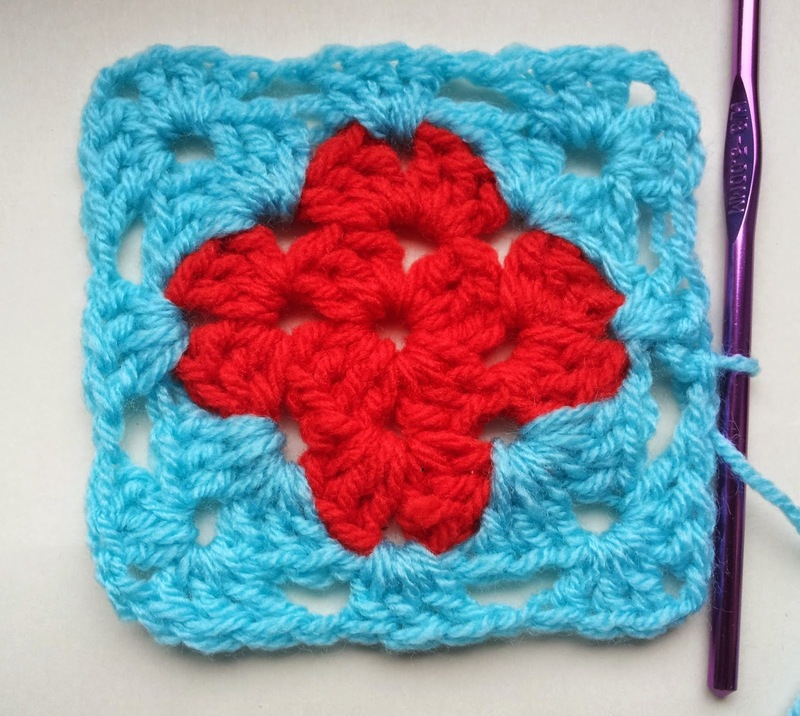 4th round: continue as for a traditional granny square, i.e. a cluster or shell of 3 2 DC [TR] in each space, with corners made of 3 DC [TR] , 2 chains and 3 DC [TR]. I'm not old, am I? Not that I'd have a problem if I were properly old, i.e. 90, but I'm barely forty and in my head I'm still really young. My body's ticking along, doing what it's supposed to do. I have small children. I listen to music that's in the charts. I even know the words - some of them, anyway. I have a Twitter account - okay, I don't use it, but I still have one, just in case I felt the need to summarise the minutiae of my daily existence in 140 characters (but, obviously, this sentence alone shows you that this is something I would most likely be incapable of.) Yet somehow a rift has emerged between me and the people coming behind me and it's social-media based. I think I've figured out what it is. 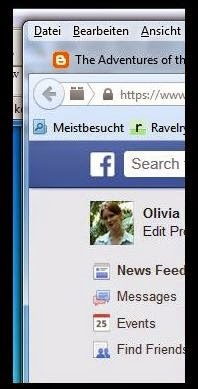 First off, I like Facebook - even if Mark Zuckerberg knows more about me than I probably do - and I even have two accounts, for my Irish and German lives respectively. But certain aspects of it are beyond me: it serves as a means of frightening the bejabbers out of a person. I mean, I never realised there were so many things just waiting to kill me till I joined Facebook. There I was, just raising my children and minding my own business, then suddenly, I am made aware - by way of badly-punctuated memes - that I am slathering them in carcinogenics on a daily basis. Suncream! Fabric conditioner! Water!!! See, I thought I was feeding my children but instead I am stuffing them with chemicals and plastic which will render them one-eyed, senseless and impotent. Instead of going out to work to pay for our mortgage, I should be at home scrubbing my counter-tops with baking soda and vinegar, making bread from wheat I grew in my flowerbeds, dunged only with the contents of our loo. The most disturbing thing about Facebook - from the point of view of my rapid ageing - is the marked difference between me and my little brother's generation. My youngest brother was born when I was eighteen: he could've been my son (and was, to our mutual annoyance, often mistaken thus). In social media terms, he is an entire generation - which accounts for millennia and several billion light-years - away from me. I spent my youth trying to avoid being photographed. In my day, it was considered the sign of successful teenagerdom if you managed to spend the decade without your likeness being captured on film in any form. God knows, there are thousands of Irish households with family photos devoid of teenage offspring. But this generation - this generation delights in taking photos of themselves! They do it constantly and everywhere! Social media are splattered with photos of young ones pouting and posing and making funny shapes with their fingers into the lens of their mobile phone - hundreds of photos, readers, hundreds! (And mobile phones, people! Mobile phones!!! Remember when you had 36 photos on your film and you thought carefully before you pressed the button of your camera? Uh-huh.) Young people in need of a hair cut, wearing Granddad glasses and excessive make up, duck-bumming in front of national monuments, natural phenomena and nameless other objects. When they're not doing that, they're trying to get as many people behind the lens as possible, creating a photographic equivalent of the clown car at a circus: pile in a whole heap of friends Having Fun and Being Awesome and post it on social media so the three people who haven't managed to squash into your picture will know that they weren't there when fun was had. People can't eat food any more without photographing it. No one can go anywhere without tagging themselves (and I might mention that in my world, farmers tagged cattle so they could find them if they wandered off. Now we're tagging ourselves. Good grief.) It's enough to give old farts like me palpitations. And I am a proverbial old fart because lots of people much older than I are hip to the new media.The Queen, Bill Clinton, the Dalai Lama and even the Pope are not averse to photo-bombing or selfies (see how casually I bandy about these new words, all confident-like?) Oh, dear. That's all I can say to that. I don't think the Internet is ready for my mug: there's been enough turmoil in the world without adding my visage to the mix. I really am not the most maternal person. I'm really not. But I have two children and, in general, the smallies seem to like me. This is rather perplexing because I think I look rather stern. But maybe it's the combination of my frowny countenance and the ginormous handbag that gives me the Mary Poppins-esque air that attracts the little blighters. For very often I am the mother at the playground who is generally surrounded by other people's children, as they vie with each other to tell me their family's most intimate secrets ("My Daddy got a new motorbike and this morning he fell off it funny and hurt his privates." "My Gramma has a tattoo of a cat on her leg." "My Mama says Aunt Philippa has more money than sense.") If you see my in the corner by the swings, watch out. A full-on confessional is probably taking place. At the moment, I'm in a Weary Mother phase. I love my children, don't get me wrong, but I have a particular fondness for them when they are both asleep. Fast asleep. Let me not put too fine a point on it: right now, my main function in life is mobiliary. My children are either climbing on me, swinging under me, hanging off me, or in the process of doing any of the above. There are days when I do not have twenty minutes where all my limbs are devoid of toddlers or infants, and my own to do as I please. Sometimes I perambulate through the apartment with the small one in one arm and the (slightly) bigger one attached to my leg, or spend entire afternoons sitting under the little one (who's at the annoying stage when he wants to do much more than he actually can, so I have to help him out) while the bigger one builds his train tracks around me. I have a notebook in which I scribble random words that mean a lot when I write them. Twelve long hours later, I have problems remembering what "fish chocolate bar" means. But it was brilliant when I wrote it. He needs a climbing frame, like a cat. My blog has suffered greatly as a result. When I finally get them to bed (and read the word finally like a great, big sigh) all the ideas I tried to scribble down during the day are gone ... or it's just too much effort to write them down in words so that other people will understand them, too. My youngest has been teething for months and he's cutting those teeth on my chest. I'm pretty sure you can buy a pair of latex breasts somewhere in the depths of the internet but, frankly, I'm afraid to look for fear of what I'll find. In any case, I write this at 10.50 pm and, for the first time today, he's not attached to me in some way. The relief! So this post is just a big thank you to everyone who wrote heartening, generous, kind, sweet and encouraging comments in the last few weeks. Some of them were so thoughtful, I was really moved. Rather than throw in the towel (The Towel of Frustration), I'll keep going. It's been a good way to start the new year. I'll stop being a Moaning Minnie now, I promise.